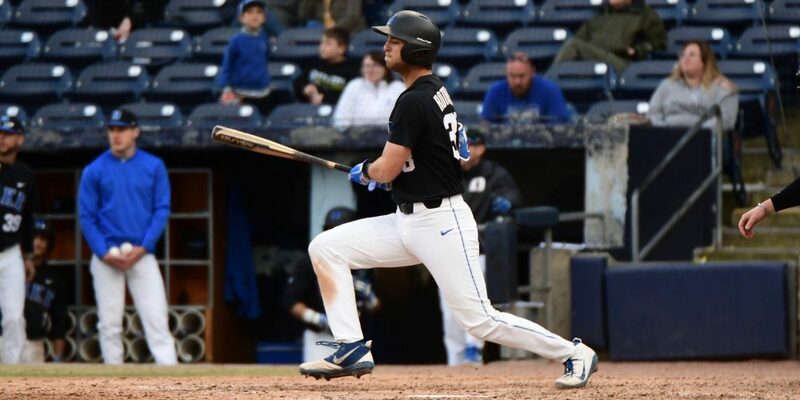 DURHAM, N.C. — In the fall of 2017, Duke coach Chris Pollard predicted that Michael Rothenberg had stardom in his future — he just had to wait for his opportunity. Rothenberg saw limited playing time as a freshman on a 2018 team stacked with seasoned veterans, but he entered his sophomore year this spring as one of the most obvious breakout candidates in the ACC, an expected centerpiece of Duke’s remade lineup. A 6-foot-3, 210-pound switch-hitting catcher with big power potential and a rocket arm, Rothenberg has All-America-caliber tools. He showed glimpses of his enormous potential in the first five weeks of this season, but he entered Friday’s series opener against Wake Forest hitting just .221/.347/.364. Put more bluntly, Rothenberg was a beast in Friday’s 16-2 win against the Demon Deacons, going 3-for-4 with four RBIs, a walk and three runs scored. Batting from the left side against righty Colin Peluse, Rothenberg set the tone in the first inning, driving a 92 mph Peluse fastball on the outside corner into the opposite-field gap for a two-out RBI ground-rule double.